The days of keeping one's pets away with friends or family before a trip are gone. As the world is changing, so hotel policies in offering pet-friendly rooms and suites, making it much easier for people to take their pets along with them. With the growing trend of taking pets on trips, more and more people seem to make this practice be seen on social media platforms through photos and videos. And where other than Instagram will this trend be seen in its peak? Pets, especially dogs, have always had a special place in people's heart. With more and more dogs being taken on trips across the world, one can do so much before succumbing to the cuteness of these canine delights. These dogs have become celebrities in their way and will continue to have loving followers all over the world. Following lines will talk about the various dogs who have taken over Instagram, and the Internet, with their cuteness, loving and adventurous spirit. 1. Marilyn Monroe's grave in Los Angeles. 2. President Lincoln's house and grave in Springfield, Illinois. 3. The smallest post office in the U.S.
4. The Route 66 Museum in Pontiac, Dallas. 5. The Cadillac Ranch in Amarillo. 6. The Blues Brothers' jailhouse in Joliet, Illinois. 7. Taos Pueblo in New Mexico; Las Vegas. 8. The southernmost point in the U.S.
9. Monument Valley and the Grand Canyon. 10. The Chinatown Gate in San Francisco. 11. The dog-friendly beach in Carmel. 13. Elvis's birthplace in Memphis. 14. The Gateway Arch in St. Louis. 15. The amazing murals of Wynwood, Miami's arts district. 16. Big Sur, the bus stop in California. 17. Many more places in Italy, such as Venice, Rome, Milan, Florence, and the Tuscan hills. Then there is Max and Louise, the Parson Russell terrier duo who have gained the attraction of many Instagram users. This pair was born in France and currently resides in Lisbon, Portugal with their owner Thiago Ferreira. Their Instagram handle @max_et_louise has over 81.8k followers. The famous places which this duo has visited include the Intercontinental in Lisbon, the Conrad Algarve to the Tennerhof Gourmet & Spa in Austria and the Forte dei Marmi in Tuscany. All of these are also reputed to be the best dog-friendly hotels in the world. Another such duo is Django, a daschund, and Chloe, a Parson Russell Terrier from Rio de Janeiro. Their Instagram account @django_and_chloe has over 18.5k followers. These lovable pooches have made stops in quite a few countries, among which Munich was the most pet-friendly city. Apart from this, they have also visited Portugal, Spain, France, Austria, Sweden, and the USA. Los Angeles is also one of the owners as well as the pair's favorite destination because of the many dog lovers living in the city. Following them is Loki, the wolf-dog. Owned by Kelly Lund, Loki became an internet sensation after Lund started posting the wolf dog's photos on Instagram. Today, Kelly Lund has quit his job and is fully focused on his dog's social media account. The Instagram account @loki has over 2 million followers. Loki is a low-content wolf dog, mostly malamute and husky with his lineage going back to at least one wolf. Along with Kelly, Loki has traveled to many places around the USA and overseas. These places include Colorado, California, Utah, Les Cheneaux islands, etc. Other names in the vast list include @travelingchapatiIndian Pariah Dog, Follower count - 30k, @henrythecoloradodogFollower count - 1.2 million, Aspen and Koa from @samanthabrookephotoFollower count - 37.8k, etc. 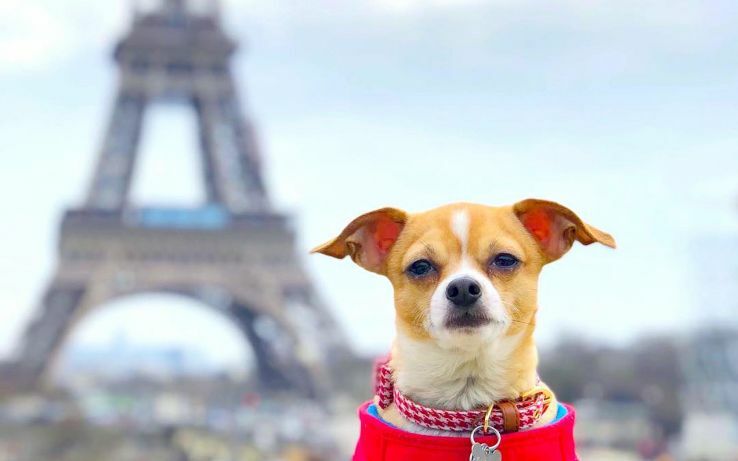 Thus, these dogs are unanimously loved by all for their daunting spirit and unfazed companionship they offer to their owners while they travel all around the globe. With the growing popularity of Instagram, these pets are becoming the main attraction of travel blogs, vlogs, etc. As said through generations, a dog is surely man's best friend.